With the TC75 you rely on an advanced generation of professional mobile computer in virtually any industry. 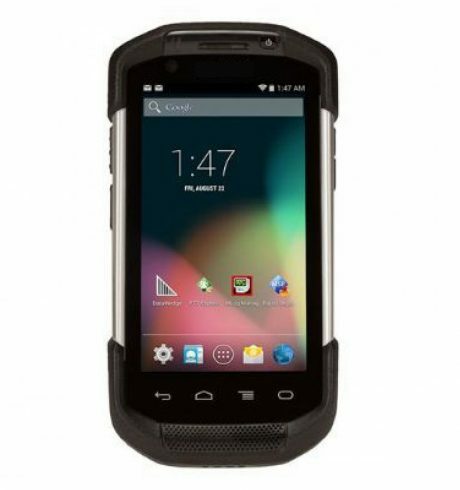 Based on the Android operating system KitKat (4.4.3) the TC75 provides intuitive smartphone operation and reduces investments into training and instructions to a minimum. The integrated Android extension Extensions (Mx) also contains a range of professional features and makes the TC75 a full MDE for demanding applications. Additionally, its numerous communication options increase mobility. With Wi-Fi 802.11 b/g/n the TC75 provides fast in-house data access and supports field technicians with rapid speeds for accessing large amounts of data, thanks to the LTE standard. Bluetooth 4.0 and NFC ensure for a quick connection to peripheral devices. With the convenient push-to-talk real-time communication feature, the device also offers real added value for the daily exchange of information. For those who rely on high performance and many application possibilities, you will not be disappointed – the 1.7 GHz dual core processor and 1GB RAM take care of the job every day. The 4.7″ display with capacitive touch technology also is operable with gloves – even when it’s wet. For simple documentation of shipping damage, signatures and more, there is an integrated powerful 8 MP camera with autofocus in the rear. For fast and reliable capture of barcodes the TC75 features an integrated imager for all common 1D and 2D barcodes with the proven engine SE4750SR. Thanks to its modular versatility the TC75 is quickly ready to use in different environments. Put on the optional gun extension for your demanding warehouse environment, or expand the device with a magnetic card reader for stationary and mobile applications in retail. With the numerous charging options, as well as a more powerful battery, you increase the productivity of the TC75 and avoid energy shortages. In industrial environments, the TC75 feels right at home: the robust housing with a Gorilla Glass touch surface is IP67-protected against dust and water, as well as other debris. It withstands drops of up to 1.8 m. Even in freezing cold -20° C, as well as above-average high temperatures of up to 50° C, the TC75 is always reliable.